It is not obvious, but North Korea could be the best thing for the relationship between the United States and China since the collapse of the Soviet Union. Whether or not that potential is realized, it is not difficult to understand why it exists. Such a relationship could survive just about anything – except the disappearance of the common enemy. And this is of course precisely what happened with the end of the Cold War in 1989 and the demise of the USSR at the beginning of 1992. The US-China relationship, however, showed surprising resilience, finding a new rationale: economic interdependence. Americans were happy to buy vast quantities of relatively inexpensive Chinese manufactured goods, demand for which provided jobs for the tens of millions of Chinese who moved from poor agricultural areas to new or rapidly expanding cities. For its part, the United States was mesmerized by the potential for exporting to the vast Chinese market, which was hungry for the more advanced products it wanted but could not yet produce. Many in the US also believed that trade would give China an increased stake in preserving the existing international order, increasing the odds that its rise as a major power would be peaceful. The related hope was that political reform would follow economic growth. Calculations such as these led to the US decision to support China’s entry into the World Trade Organization in 2001. 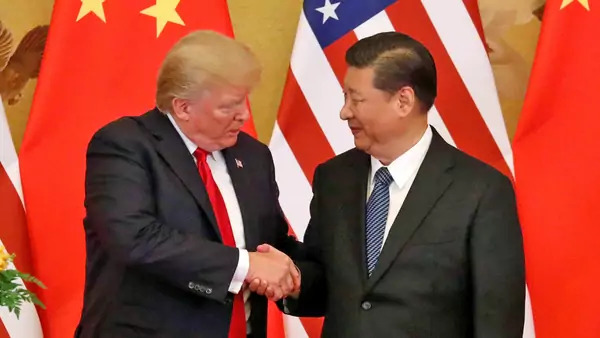 Now, years later, the economic ties that had become the foundation of the Sino-American relationship have increasingly become a source of friction that threaten it. China exports far more to the US than it imports, contributing to the disappearance of millions of American jobs, and has not opened up its market as expected or delivered on promised reforms. Moreover, China’s government continues to subsidize state-owned enterprises, and either steals intellectual property or requires its transfer to Chinese partners as a condition of foreign companies’ access to the domestic market. This critique of China is widely embraced by US Republicans and Democrats alike, even if they disagree with many of the remedies proposed by the Trump administration. And the criticism is not limited to economic affairs. There is growing concern in the US about China’s increasing assertiveness beyond its borders. The Belt and Road Initiative appears to be less a development program than a geo-economic tool to expand Chinese influence. China’s broad claims to the South China Sea and its creation of military bases there are viewed throughout the region as a provocation. China’s domestic political development has also disappointed observers. The abolition of the presidential term limit and President Xi Jinping’s concentration of power have come as an unwelcome surprise to many. There are also concerns about the suppression of dissent (often cloaked in the guise of Xi’s anti-corruption drive), the clampdown on civil society, and the repression of western China’s Uighur and Tibetan minorities. The net result is that it is now commonplace for official US government documents to pair China with Russia and to speak of it as a strategic rival. All of which brings us back to North Korea, whose nuclear weapons and long-range missiles are viewed by China as a genuine threat – not to itself, but to its regional interests. China does not want a conflict that would disrupt regional trade and lead to millions of refugees streaming across its border. It fears that such a war would end with a unified Korea firmly in America’s strategic orbit. Nor does it want Japan and other neighbors to rethink their long-standing aversion to developing nuclear weapons of their own. The Chinese government also opposes South Korea’s missile defense system (acquired from the US in response to North Korea’s missile deployments), which China sees as a threat to its own nuclear deterrent. China and the US thus have a shared interest in making diplomacy work and ensuring that any US-North Korean summit succeeds. The question for China is whether it is prepared to put enough pressure on North Korea so that it accepts meaningful constraints on its nuclear and missile programs. The question for the US is whether it is willing to embrace a diplomatic outcome that stabilizes the nuclear situation on the Korean Peninsula but does not resolve it for the foreseeable future. A US-North Korean summit that averted a crisis that would benefit neither the US nor China would remind people in both countries of the value of Sino-American cooperation. And the precedent of the world’s two major powers working together to resolve a problem with regional and global implications might provide a foundation for the next era of a bilateral relationship that, more than any other, will define international politics in this century.